Sara Nephew is a quilt designer, author, teacher, and has developed several isometric (60°) triangle rulers. Sara's quilting career has taken her all over the United States, Canada, and Australia. Her quilts have been exhibited in many places. 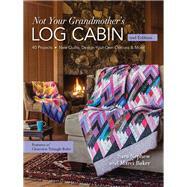 She has been featured in magazine articles, and her quilts have been in books by other authors. Marci Baker enjoys sharing ideas that simplify the process of quilting. She has been featured in Redbook, on Home and Garden TV's Simply Quilts, Quilters' News Network, NBC's The Jane Pauley Show, and has been published in American Quilter Magazine and Traditional Quiltworks. Marci spends much of the year traveling and teaching classes for quilting guilds and trade shows.